Carson Wentz throws to Wendell Smallwood (right) as the Colts’ Al Woods pressures him in the third quarter. The Eagles rebounded after their Week 2 loss to beat the Colts, 20-16, in Carson Wentz's season debut. How did each position group perform? Read Paul Domowitch's analysis and grade them yourself. No Jay Ajayi and Darren Sproles? No problem. With excellent blocking from their line, running backs Corey Clement, Wendell Smallwood, and rookie Josh Adams piled up 142 yards on 32 carries. The Eagles had a season-high 10 rushing first downs and five runs of 10 yards or more. Smallwood might have saved his roster spot with an impressive performance that was highlighted by a four-yard touchdown run that gave the Eagles the lead with 3:02 left. Carson Wentz completed 25 of 37 passes for 255 yards in his long-awaited return from injury, but the first-game-back rust was evident. He turned the ball over twice. And he struggled on third down (two sacks, just three passing first downs on nine attempts). One of them was huge, though. He hit Nelson Agholor for a 10-yard completion on a critical third-and-9 on the Eagles' game-winning touchdown drive. Take Andrew Luck's 33-yard second-quarter scramble out of the equation and the Eagles held the Colts to 35 yards on 12 carries. Aside from Luck's run, the Colts had just one run that gained more than five yards (a 14-yard third-quarter run by Nyheim Hines). The Colts had just four rushing first downs the entire game. A week after struggling mightily against Ryan Fitzpatrick and the Bucs' passing game, the Eagles did a nice job stifling Andrew Luck. They kept T.Y. Hilton and the rest of the Colts receivers in front of them and limited their yards after the catch with sure tackling. Luck averaged just 4.1 yards per attempt and was just 4-for-11 for 10 yards on third down. Jake Elliott made two of his three field-goal attempts, missing only an early 55-yarder that went wide left. Corey Clement struggled as Darren Sproles' punt-return replacement. He averaged just 1.3 yards per return and had a near-fatal fumble late in the third quarter that he managed to recover. Dave Fipp's punt and kickoff coverage units turned in a solid performance. Carson Wentz made his long-awaited return and had his ups and downs. Until they get Alshon Jeffery back, the Eagles offense — which is averaging just 19.7 points per game –will continue to struggle. 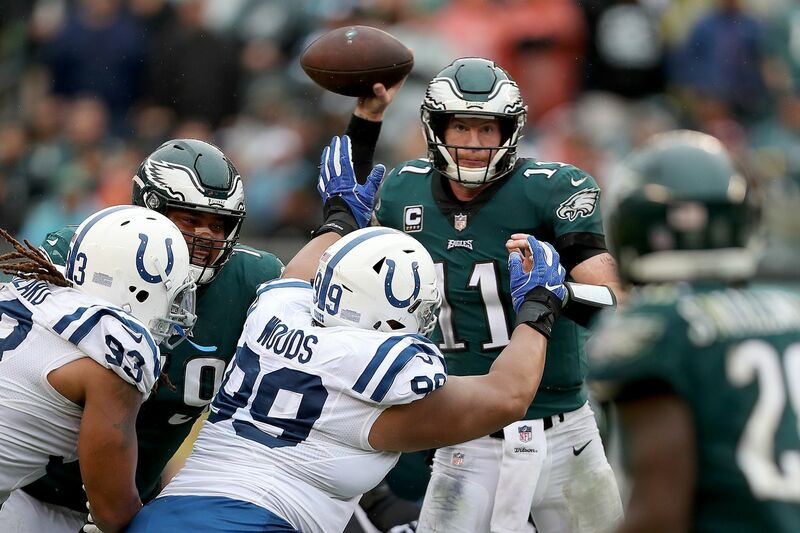 Were it not for the impressive play of Jim Schwartz's defense, which thwarted four of the Colts' five red-zone challenges and allowed them to convert only two of 12 third-down opportunities, the Eagles would be 1-2 right now rather than 2-1.